Build your account, its FREE and easy. Your account and tags are compatable with EVERY JBF sale in the US & Canada. You can just sell, and/or help with the sale in exchange for a early bird shopping time. It's so simple, walk through your home and collect all of your gently loved items. Inspect your items for tears, holes, stains, etc. Register for the sale using our FREE system and create your tags. Bring your items to drop off at the times below. If you chose to donate all of your items, you are done. If you would like to pick up unsold items, look below for pick up times. .....and 14 days later, your check is mailed. Cha-ching!! 1. PrePay & Register by Aug 15 & save 50%! You'll only pay the amount listed....no tax, no hidden fees, no surcharge! Visit Eventbrite to prepay your consignment fee. 3. After August 15th, you can still register for the sale. However; a $10 registration fee will be deducted from your check at the end of the sale. No time to tag your items, let our Taggers take care of that for you. Just gather your items and drop them off. They'll do the rest. Click HERE for more information. Consignors make 60% on all items sold! Want to make a higer percent? Then listen up, opportunity is knocking! Print, review, sign, and bring this WAIVER to drop off. At 7:45 pm all remaining items are donated to our charity. Sorry, no exceptions! For every new consignor you refer to JBF Charlotte, you will be rewarded! *Your referral must sign up & consign 25 items at the August sale. We sell children's clothing Newborn through size 20 (limit 10 girl's junior size items, Abercrombie, Hollister, Roxy, American Eagle, Nike, Volcom, Burton preferred) as well as maternity sizes (limit 10 maternity clothing items per consignor). Our Fall Sale is fall & winter clothing only (what your child would wear between October-March). Be picky. Look at your clothing items as if you were going to purchase them. No stained or damaged items will be accepted. Any items that look like "mom's" clothes will be rejected at inspection. Please freshly clean your clothing items. Replace missing buttons, sew loose hems and seams, and clip loose threads. Please button all buttons, snap all snaps, zip all zippers before you arrive at drop off. This will ensure that there are no defects in the clothing. The newer the item looks (and the better it smells), the better it will sell. Package & Hang: Hangers - Please hang clothes so the hanger hook points to the left (like a question mark). Hang size 0-6 clothing on child-size hangers and sizes 7-20 and maternity clothing on adult-size hangers. Clothing that falls off the hanger onto the floor does not sell well. Old Navy and many outlet stores are great places to get free hangers (they throw away hangers daily!) and WalMart & Target sell child-size plastic tube hangers at a great price. Clothing Sets - Sets tend to sell better (under size 6) so match things up if you can. All garments should be hung with the hanger hook pointing left (hanger should resemble a question mark when looking at the front of item). Safety pin or use a tagging gun to attach clothing sets securely with bottom garment hung on the backside of the shirt, so both pieces can be viewed without separating them. Pants/Shorts - Pant-clip hangers are great but if you use a standard hanger, simply use your tagging gun to attach pants to the top part of the hanger so the garment will not slide. Onesies, socks, tights, hats and infant mittens need to be in a clear zip-lock bag (you may group multiple items in one bag). 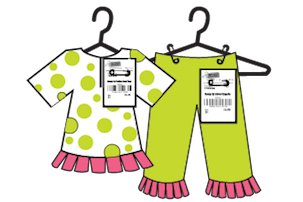 Please be sure to label your tag well so that customers know if the items are short-sleeve onesies or long-sleeve onesies. Household items that other families will use (no knick knacks please). You may consign storage solutions (baskets, bin, shelving), furniture (no upholstered items), decor (lamps, wall hangings, no antiques), and kitchen items (small appliances, utensils, etc.). Please Note: For this category this is No Donation Option: unsold Mommy Mart items must be picked up by the Consignor after the sale. We are not able to donate these items after the sale. WE WILL TAG YOUR ITEMS! No time to tag? No worries, we got you covered! Our valet taggers are geared up and ready to assist you in getting your items ready for the sale. It really is easy, gather your items, organize by size and viola, your done! Review the contract for more information. Ready to sign up, email me to get started.